This is the last installment about the Waptus trip. Being there stimulated some reflection on the topic of change. I first went to Waptus Lake in 1991, and again in subsequent years. The usual trail crew stay is five days. For many years, the place was familiar and relatively unchanged. 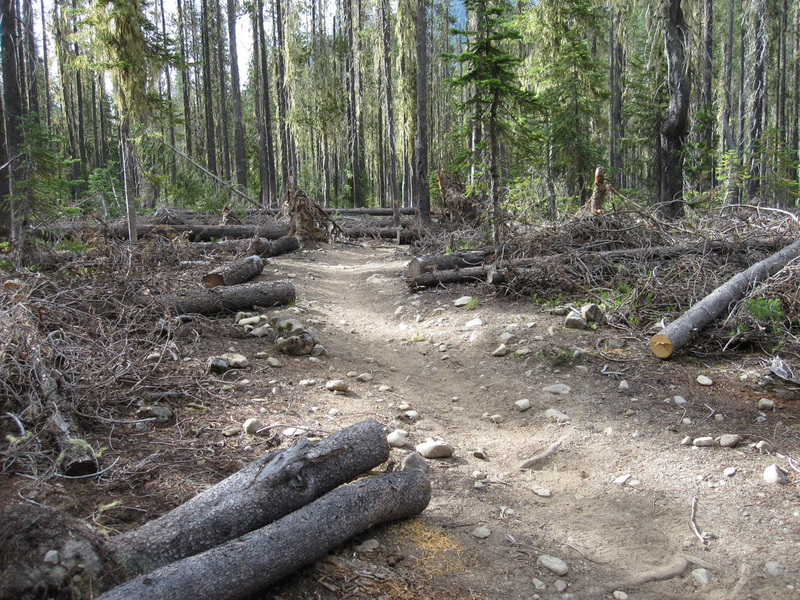 Each year is a little different for the trails–the number of big logs down, the severity of washouts. But it seemed stable. In 2006, the big bridge across the river was gone. 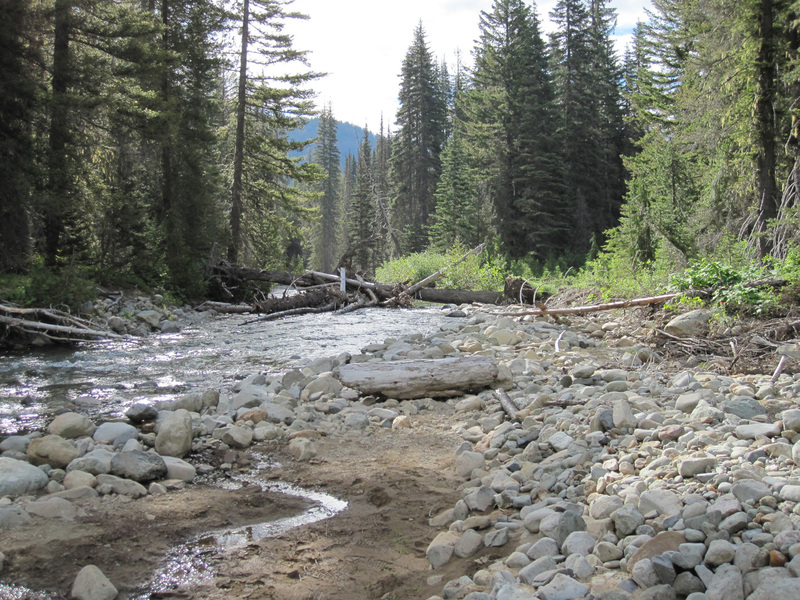 No one knows exactly what happened to it, but we speculate that a log jam took it out during a flood. The metal stringers are twisted and partially buried downstream. Pieces of decking appeared four miles away. The wilderness becomes more wild when you have to ford a swift river instead of crossing over a nice solid bridge. Spinola Creek changed during that 2006 flood. 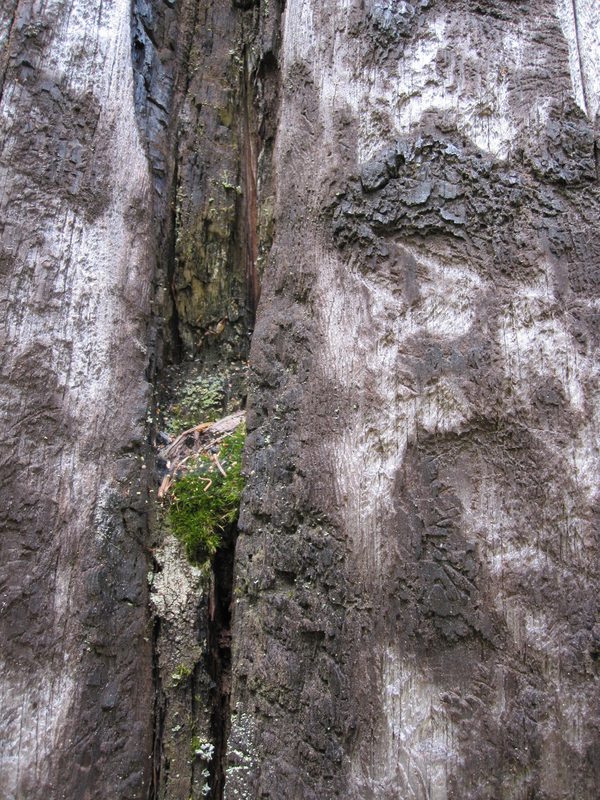 The big cottonwood tree near our campsite fell across the creek, and has since captured more wood in a log jam. We used to have a nice cobble beach, and easy access to our bathing spots. Now the creek eats into the bank a little more each year, and the cobbles are moved. There are new gravel bars. The flood was the first change. In July of 2007, a strong downdraft of wind swept down out of a thunderhead, and many lodgepole pines were uprooted. We went in the following week to find many across the trail and in our camp. It took three of us all of one day to cut 27 new trees from a quarter mile of trail. 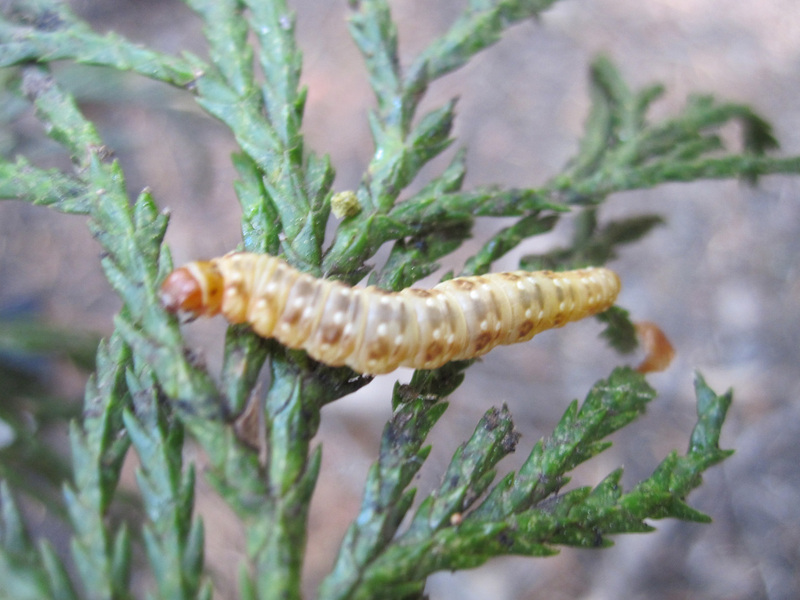 We first noticed a spruce budworm outbreak in the Middle Fork of the Teanaway around 2002. Within two years, the infestation appeared in the upper Waptus drainage, and in Spinola Creek. The Douglas-firs and true firs have been hard hit. The green of the forest turns to dull red, then gray. My own hypothesis is that the suppression of wildfire for 100 years has opened the way for a different agent of change. The jury is still out on the effects of global climate change on forests. Budworm has swept through the woods like a fire, but with different results. This little caterpillar, which dropped onto my shoulder as I hiked out, is about an inch long. There must be millions of them up in the trees. They hatch from eggs laid the previous summer, and chew their way through the new growth bursting from the buds of the trees. Their numbers are great enough to affect bird demographics. For years we never saw evening grosbeaks at our Spinola Creek camp. Now they are the most common bird, busily eating caterpillars. Out on the trail, if you stop and listen, you can hear the tiny pattering sound of frass (caterpillar poop) hitting the vine maple and thimbleberry leaves of the understory. Within a few weeks, the budworms will metamorphose into small grayish moths–millions of them laying eggs that will hatch next spring. I observe all these changes, and am fascinated by them. A part of me craves the familiar. I want things to stay the same, because sameness makes me feel comfortable. But then I look at my own life. How much I have changed since the summer I was 31 years old and at Waptus for the first time. Much water has gone down the river, and maybe some of those water molecules have risen up off the ocean into clouds and returned as rain and snow over the mountains. Maybe. I imagine all of the cells in my body have changed since 1991–the only thing that is the same are the electrical impulses containing my memory. And even that has altered from how I first experienced it. What is it about our humanity or culture that makes us so resistant to change? Why do we perceive change as disruptive and painful? Evidence is all around us that things do not stay the same. Much of the Waptus River drainage burned in the early part of the twentieth century. That’s why there are lodgepole pines at our campsite. They have short lives, only 80 to 100 years. Soon they will join the old logs decaying into the ground at their feet. When I see that cycle, I stop questioning. I have lived long enough now to know that there’s a bigger picture, one that I can accept. One that I can continue to learn from. thanks for all the work done on the trails in that area! I LOVE the Waptus Lake area and area around Cle Elum in general and greatly appreciate all the efforts! Thanks for thanking us. Obviously, Waptus is a favorite of the trail crew as well.